These set up bars are GREAT!!! They allow you to make easy and accurate measurements. I have a couple of photos to show you. The first is the brass set up bars in action. I used them to set up the spacing in this router jointing operation. 3/8” set up bar and a 1/2” router bit yields 1/16” off each side. Couldn’t be easier. The second photo is of some boxes I made using the Oak Park router box joint jigs and the Whiteside brass set up bars. Once again, set up was a breeze. You can find them at Woodcraft and Rockler, for starts. Now the downside. They are only available (for what I can find by Googling) in SAE sizes. You know, inches. I am looking for these same bars but in metric sizes. I think they would help us SAE-folks in the US when we try to set up drilling cup holes for Euro hinges and other things. You know, when they call for 4mm or 6.5mm to get the right overlay and/or reveal. If you know of a supplier of these, please post in the comments. You woodworkers in the rest of the know world must be using metrics and not SAE for setting up. Let’s hear from you. Thanks for reading my review and really thanks for getting this far in my review to read my “thank you”. If you are careful around your blades, you can use metric drill bits to set spacing and measurements. I also have a set of brass set up bars in my shop. Before I had them, I thought the idea of brass bars was useless. Now that I have them, they are PRICELESS. I use them almost every time I’m in the shop. As a matter of fact, I use them so much for different things, I’ve thought about buying a different set just to keep on the other side of the shop. Great post Marty! I’ll check with the Brass to see if I can buy some brass. Good evening, look at McMaster Carr or just about any other industrial supply house and search “key stock” brass seems to be the cheapest but I know that my 18-8 stainless bars work well in the shop. If you buy from McMaster Carr they come in 12 inch lengths and will allow for 3 or 4 “sets” to be made and shared. I got a assorted set of key stock at Harbour Freight. Less than $10. It has 10 or 12 of each size in the set. Since I’m a ‘newbie’ I didn’t , at first, know where to see a photo of the brass blocks, That aside, for anyone needing a reference tool [for setting-up, extablishing exact repeatable measurements, etc] I’d suggest adding a set of Machinists GageBlocks [or Guage] to your tool arsenal. They’re available typically rectangular; but, also square, and round shapes. Usually a set is around 80+ pieces, in a fitted case. They’re ‘certificated’, as to dimensional accuracy. Of course less accurate ones, are less $$$; but we woodworkers don’t require as much accuracy as a metal-machinist. Different shapes lend themselves to more specific guaging. They can be used, among other things, as ‘feeler guages’ for blade>fence set-ups, depth set-ups, etc.. Extend your measuring capabilities. Perfect for router, shaper and table saw set-up. 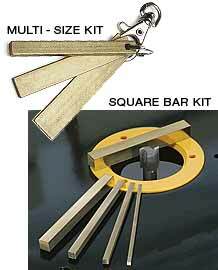 Soft metal Brass Bars won’t splinter or chip your router bit or saw blade if they accidentally hit the cutters. I picked up the metric key stock and a digital caliper from Harbor Freight. Measured the pieces and some are about a few hundredths of a millimeter smaller and some are larger than the stated sizes. I think this will work just fine for my woodworking measurements. I knew that I could count on my buddies here. I have about 5 sets of bars. I’ll give them as door prizes at the woodworking club.